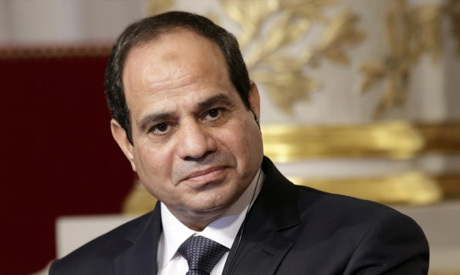 Egypt's president Abdel-Fattah El-Sisi met Saudi Arabia's defence minister Prince Mohamed bin Salman in his presidential office in Cairo on Tuesday, Egypt's state news agency MENA has reported. Egypt was quick to support Saudi-led airstrikes against Yemen's Houthi rebels and their allies who last September took control of the capital Sanaa and recently overran other major cities in the west of the country. Egypt announced that it would dispatch several naval vessels to help halt the Houthis' advance. On his arrival, Prince Mohamed bin Salman stressed the close relationship that exists between both countries' armed forces. Saudi Arabia is one of El-Sisi's main backers, having pumped billions of dollars in aid to prop up Egypt during the turmoil that followed the ouster of Islamist President Mohamed Morsi in 2013. While Saudi Arabia is seeking allies for a ground offensive to restore the government of Yemen's internationally-recognised president Abdel-Rabbu Mansour Hadi, currently in Riyadh, Egypt has eased speculation about its participation so far, saying on Tuesday that no troops have yet been sent to Yemen. Also on Tuesday, the United Nations’ Security Council imposed an armed embargo on Houthi leaders, as well as blacklisted top Houthi leader Abdelmalek El-Houthi and the son of his current ally former Yemeni president Ali Abdullah Saleh, Ahmed. Saleh was previously blacklisted in November. Egypt's defence minister Sedky Sobhi met with Bin Salman in Saudi Arabia last week. Hopefully this is the President’s message to the Prince! Otherwise we might find ourselves the out-sourced arm forces of the gulf region; putting our Economic Development on the back-burner!